This page will cover the various versions of the "Kodak Vigilant" series of medium format cameras. The Kodak Vigilant Six-20 medium format camera was manufactured between 1939-1949 and originally sold for US $38 (about US $662 in 2017). The top of the line Vigilant came with the excellent f/4.5-32 101mm Anastigmat Special (later called Anastar) lens in a Kodak Supermatic shutter (1-1/400 sec. plus B&T). There are also several shutter types including the Dakon, Diomatic, Kodamatic, and Supermatic. The Vigilant series shared a common body with the Kodak Monitor series. The main difference wast that the Vigilants had a simplified top and completely manual film advance; you needed to watch the small red window in the back of the camera to make sure that you didn't advance past the next number else you risked overlapping exposures or losing a picture. The Vigilant's top plate contained the shutter release, a reverse Galilean viewfinder, the folding bed release, and the film advance knob. Cameras equipped with f/4.5 lenses also had a parallax adjustment on the viewfinder. An old style waist-level reflex viewfinder was located on the lens mount. The Vigilant Six-20 produced a 2¼×3¼ inch image on 620 film. A version with less expensive lenses and shutters (and lacking the body mounted shutter release) was known as the Kodak Vigilant Junior Six-20. 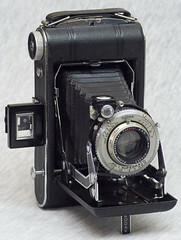 The Vigilant was also available in the 616 film format as the Vigilant Six-16 and the Vigilant Junior Six-16, making 2½×4¼ inch image on 616 film. Shutter and lens combinations were the same as on the Vigilant Six-20, though the lenses had focal lengths in the 127-130mm range.